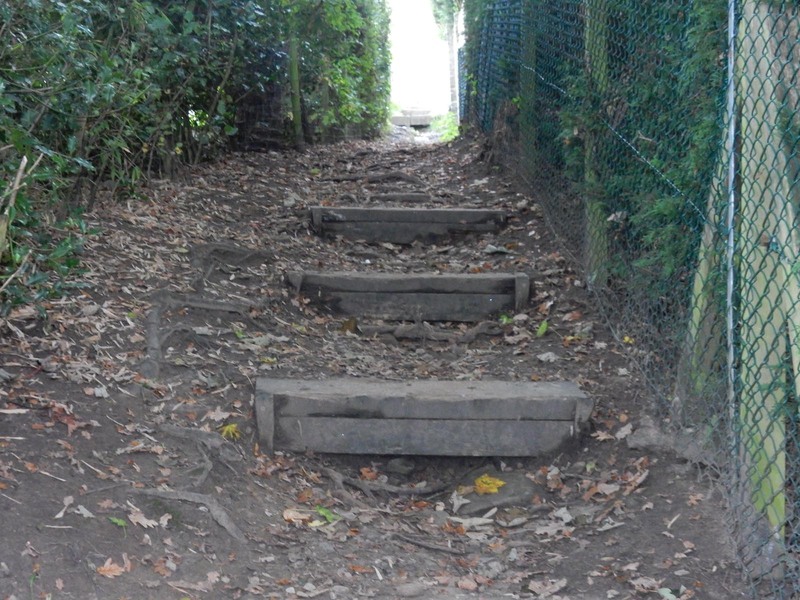 Sometime before October 2015 Evan Pedley of PROW, Crewe, asked me if our project team would repair a flight of wooden steps on Bollington FP22, which climbs from Ingersley Road up to Shrigley Rise. 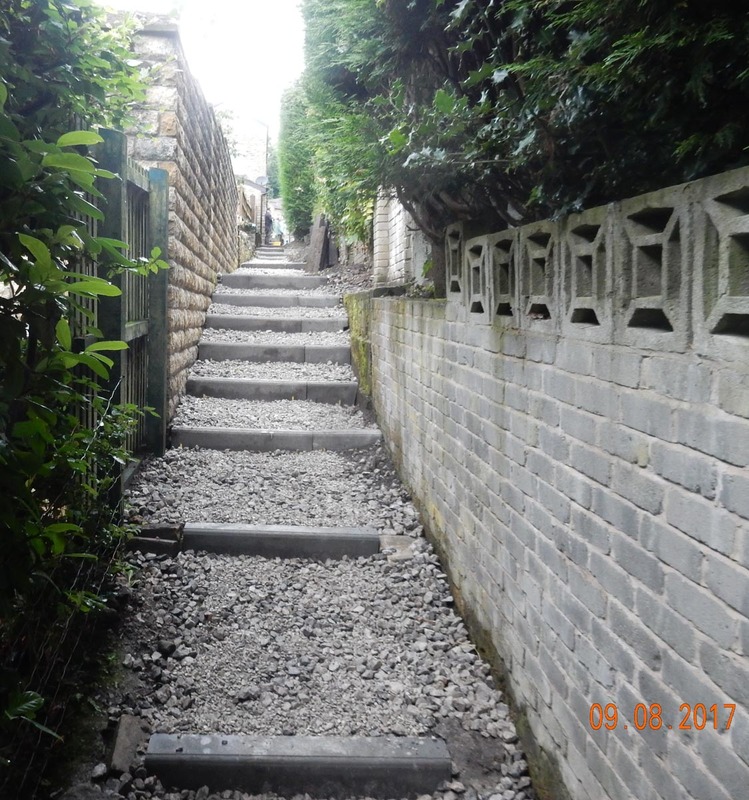 This seemed feasible at the time, because we could collect new wood for the steps as a contribution by PROW Department from its depot at Winsford; and Bollington Town Council would contribute up to £500 (plus VAT) towards materials. The path climbed over fourteen metres in height over a length of 69 metres from its start in the field below a bottom kissing gate. 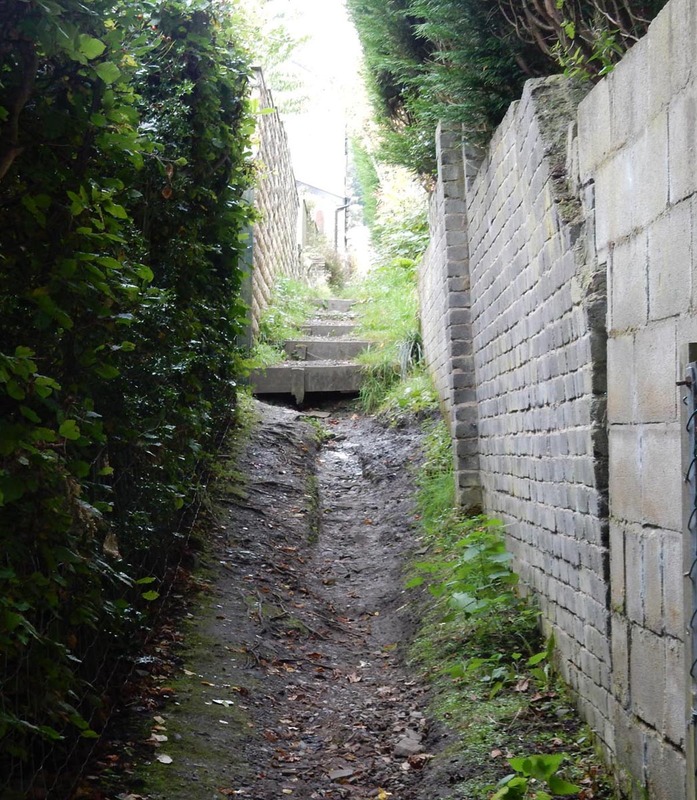 The path was a surface drain for regular rain run-off from the impermeable surfacing of Shrigley Fold, and even off the main Shrigley Road in heavy rains, at the top of the path. It formed a deep gulch (a word chosen conservatively) and walkers were required to straddle the hollow and walk the haunches when the surface was wet and slippery. It held twenty-four rotting wooden steps. Evan requested that precast concrete (p.c.) highway kerbs are deployed to resist the waters and to provide more durability than wood on this frequently used urban path. 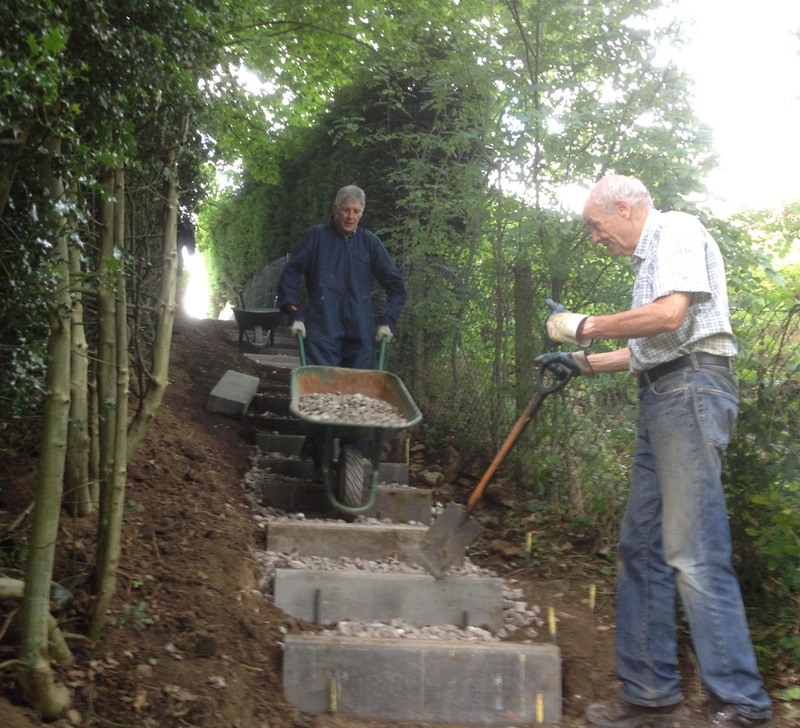 The prospect of me asking a voluntary project team of predominantly senior citizens who, with respect, are past their prime, to manoeuvre 70+ kg kerbs for 60 metres along the path, and up to 14 metres down the steps, was daunting. 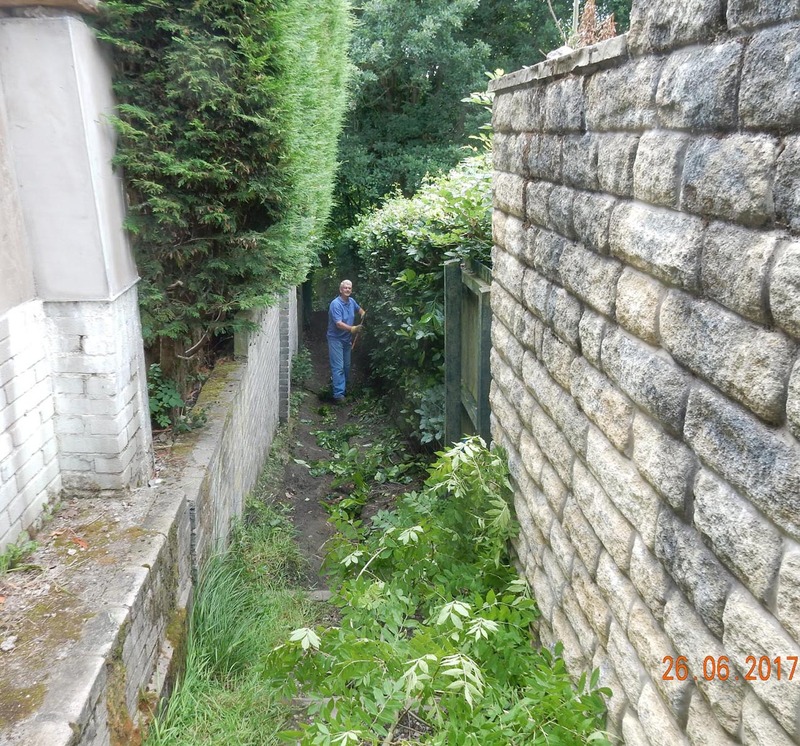 So, despite spending time on several occasions surveying the existing eroded wooden steps with my family’s help, I deferred the work to a future suitable period. Gradually, a sense of obligation took control and triggered me to allocate June through August this year, pending team support, to ‘fit’ the steps into the diary. Shrigley Rise neighbours have been very accepting of our disruption, allowing me to park as many as four bulk bags of gravel and two pallets of kerbstones on their private driveways on several deliveries, and special thanks go to Siobhan and Max for allowing us to store large tools and two wheelbarrows in their rear garden, Sarah for passing Ice cold drinks through the hedge and Rob for his oil for the wheelbarrows! Additionally, the team was given enthusiastic encouragement by path users. 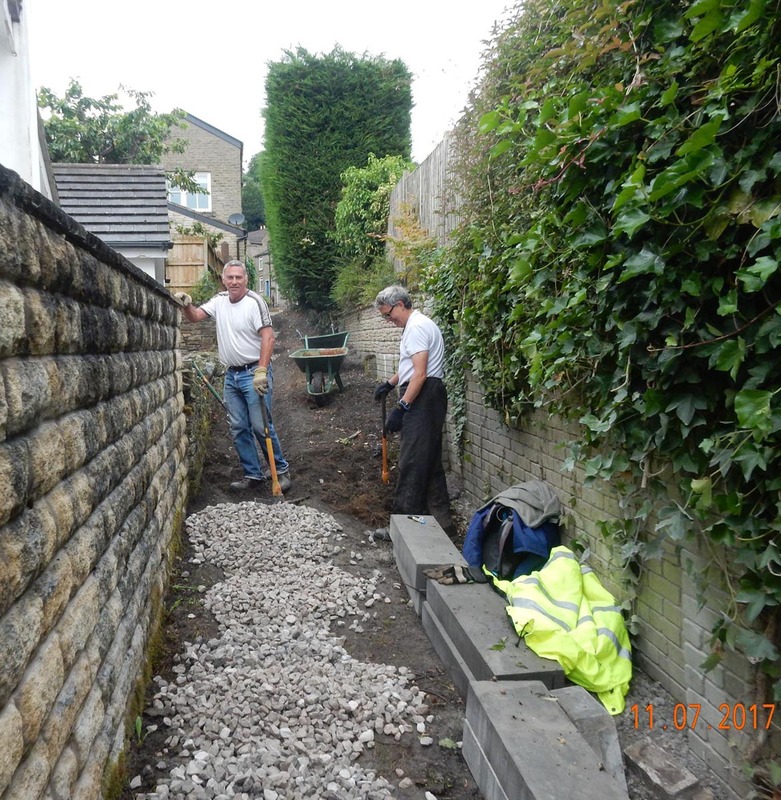 We commenced step building, by progressively removing old steps, excavating for the new ones, placing them to line and level, and constraining their facing lower edge by steel pins. For safe working we spread ourselves in pairs up the path, but inevitably found coordination and cooperation between the teams was essential to enable materials to be moved across each of the work fronts. As the workdays passed, the shape of the stairflights crystalised, and a bulge in the slope was reduced by excavating for, and lowering, some steps. The bulk of our fill material is 40mm sized limestone aggregate, which allows water to pass in a restrained manner, but is firmly positioned. A surface skim of 14mm limestone chips is gentle underfoot and knits the surface together. Several thoughts disturbed my sleep prior to starting on site: I dreaded finding we could not drive 16mm dia. steel pins 400mm into the underlying ground, to hold the kerbs in place, due to being rebutted by solid rock here and there. Such rebuttals occurred only once or twice. 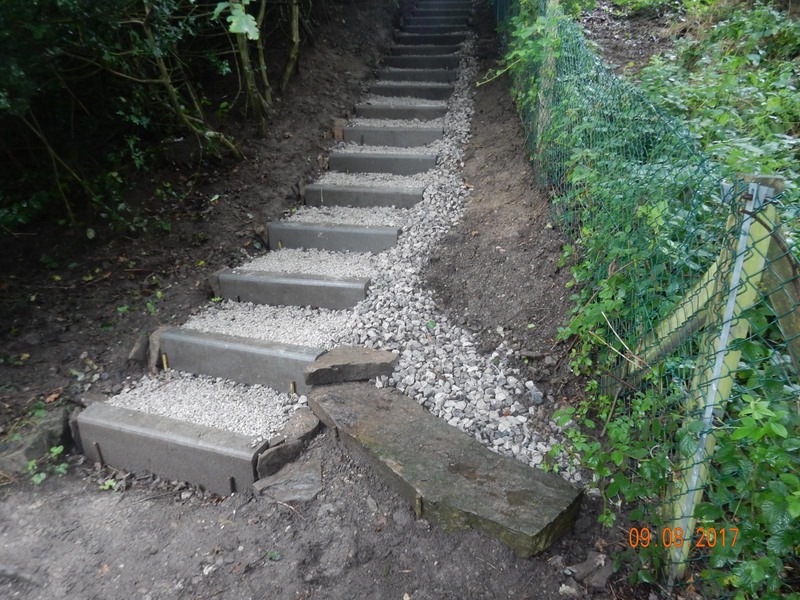 I was majorly concerned about moving the 70+ kg kerb units along the path and down the steps. I purchased a two-wheeled bag trolley to park them next to their final resting place, and two proprietary lifting tongs for multiple lifting to place them on a trolley and at each temporary and final accurately allocated placement. My overall concern, of course, was whether sufficient team support members would declare themselves willing to carry out this very heavy labour. But, as always, a team performed on each day. We completed the project on 9th August. On which occasion two walking groups of eight and twelve persons coincidentally chose to pass respectively up and down the path! Between two and six team members have attended on seventeen occasions between 26th June and 9th August, (generating 62 volunteer-attendance days) and served 296 man-hours of labour (excluding lunch breaks). 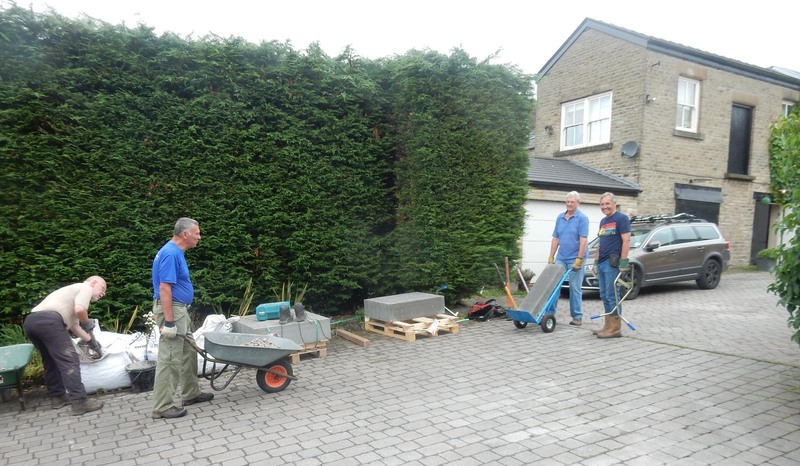 During this project, 13.5 tonnes of limestone have been shovelled, and accepting that each pc concrete kerbstone has been lifted and transported twice, 8 tonnes of pc concrete has been lifted and placed. Also, a large amount of soil has been dug, moved and reprofiled during the scheme. ECR Group have purchased £1792 (Vat Incl.) of materials, and Bollington Town Council have contributed £558 (Vat incl.) of that total. For the success of this project, my thanks go to Janet Allen, David Bates, Helen Battilana, Ian Black, Nick Brearley, Mike Collins, Roger Fielding, Adrian Flinn, Barbara Hare, Ken Hobbs, Philip Hodgkinson, David James, Roger Jubb, Gillian and Tom North, Ian Wasson, Nick Wild, Alan Wilson, my wife Helen and son Damian (as surveying assistants). This entry was posted in Footpath Projects by admin. Bookmark the permalink.